Think of a mutual fund as a family of stocks. When you hear people suggesting that you should be “well diversified” you can think of a mutual fund as providing that type of security. A mutual fund is an investment option that gives you exposure to many different companies, which essentially eliminates individual security risk, or the risk of just putting all your money in one investment or “security” (a ‘security’ a financial asset). You have the ability to invest money you have sitting in a bank (after-tax money) into a mutual fund. More commonly, you will see mutual funds offered within a retirement plan such as an IRA, 401(k) or 403(b). The mutual funds you select in for your employer retirement plan may provide you with varying levels of risk or may be presented as a “Target Date” fund, which automatically adjusts from an aggressive allocation to a more conservative allocation. 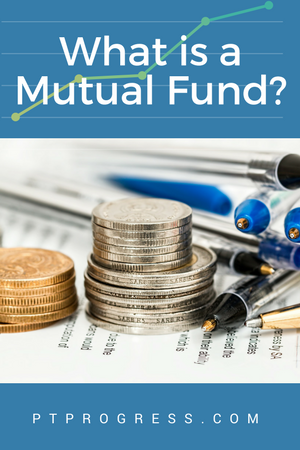 What’s In a Mutual Fund? A mutual fund can hold stocks, bonds (both corporate or government), real estate, and may even mimic the market as a whole. These types of funds are called index funds because they aim to “index” or reflect the earnings of a specific area. For example, the Vanguard 500 Index fund tracks the performance of the S&P500. By investing in this mutual fund, you own a piece of the market, realizing the ups and downs as reflected in the S&P500. As with any investment product, there are fees associated with it. It’s important to understand what investment fees are and how you can minimize them. After all, no one really enjoys paying fees, especially if you’re paying more than you should be! With mutual funds, that fee is called an expense ratio – this is the cost to run the mutual fund. An expense ratio can range from as little at 0.02% to more than 4%. The average expense ratio for stock mutual funds are usually around 1% – bond funds are generally less expensive, but hover just under 1% on average. This expense ratio is subtracted from the earnings, so you may not even notice it when you look at your statements. You have $5,000 that you want to invest in an IRA, so you open an IRA and select VFINX, the Vanguard 500 Index fund. The expense ratio is 0.14%. In year one, your statement says your return on VFINX was 9.86%. The 9.86% return on your $5,000 investment equals $493. What you didn’t see was the 0.14% that was subtracted before your returns were even calculated and printed on your statement. The cost of investing in the mutual fund was 0.14% of your total investment, or $7. Obviously, the more you have invested, the higher the fee will be. On that same $5,000 invested, let’s say your expense ratio was 1.0% or 7 times the VFINX fund. You would be paying $50 in fees for the year. Doesn’t seem too bad when you’re looking at a $5,000 account, but when your account is valued at $500,000 – a fee of 7,000 is a lot better than $50,000, agreed? You basically have the option to fund a no-load mutual fund or a mutual fund with a load – look for “no-load” mutual funds. The easiest way to tell if a mutual fund has a load is to search for the fund on Morningstar. You’ll see that searching for VFINX pulls up the quote page with “none” under the heading for Load. Class A – This type of loaded mutual fund is a “Front load” which basically trims the money right off the top of your initial investment. A 5% load on a $5,000 investment means that only $4,750 goes into your account. A whopping $250 went into the investment representative’s pocket. Class B – These are “back load” funds that essentially mix the fee into a higher expense ratio. You don’t pay up front, but you do end up paying a higher expense ratio for a few years. Eventually, these funds may turn into a Class A fund. Class C – This class of mutual funds charge you with a higher expense ratio like Class B funds, but they don’t convert to class A funds at all. 12b-1 fees – This is another type of fee that can be charged to investors to cover the ‘marketing and advertising’ costs behind a fund. Investment companies can charge up to 1% for 12b-1 fees. Whether you are just starting to invest or you’ve been investing for years and want to take more control of your money, you should really consider the type of fund you’re using and how much it’s costing you. Investing in a low cost, no load fund like any of the recommended Vanguard funds, you’ll end up saving tens and even hundreds of thousands of dollars over the lifetime of your investments. The bottom line: find a low cost, no load mutual fund and stay the course, investing regularly and with a disciplined mindset.